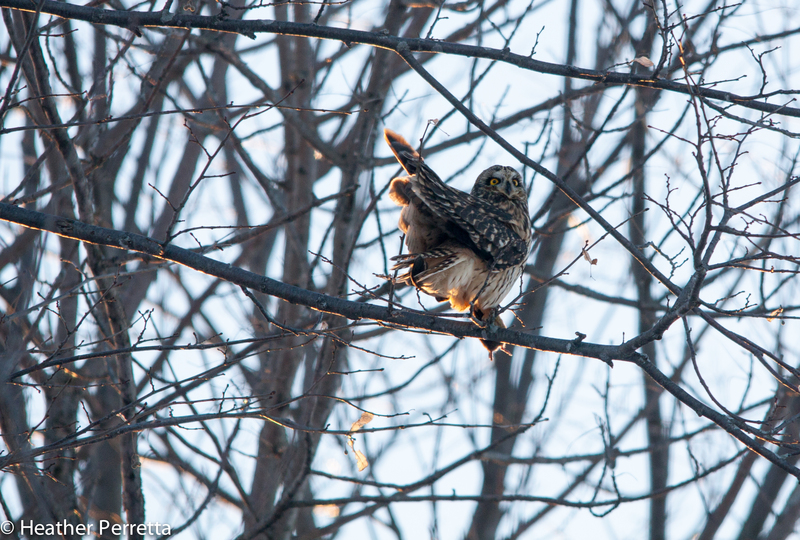 Short-eared owls are determined, scrappy little owls who are not afraid to fight for what is theirs. 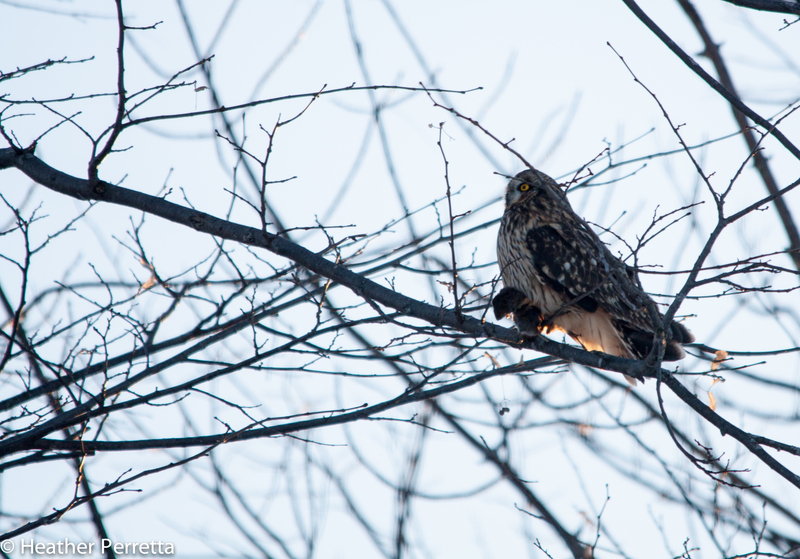 Last Friday I spotted a dark phase rough-legged hawk in a tree and stopped to get a closer look. 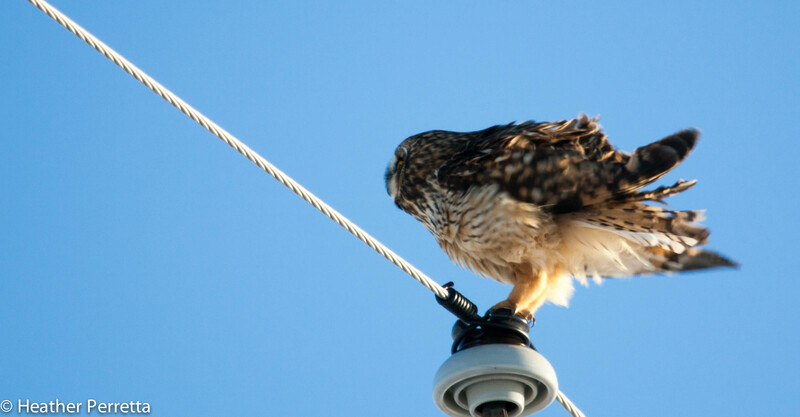 It quickly departed from its perch, which is usual behavior for hawks in that area. What happened next was an example of determination and survival instinct. The hawk gained speed with powerful wings beats to traverse the field in an instant. It reached its mark and flushed two short-eared owls out of the tall grass just as a light phase rough-legged rushed in from the other direction. The scene was a chaotic mess of hawks and owls. As the intensity of the interaction decreased it was clear that one owl took the brunt of this altercation. A couple flight feathers were plucked out of place and it seemed sluggish as it started to fly. Once the rough-legged hawks flew off to watch over the situation from a distance both owls retreated for a brief respite by perching in a small dead tree. It seemed that the owls were free from conflict but not for long. A couple minutes later one owl went back to hunting. 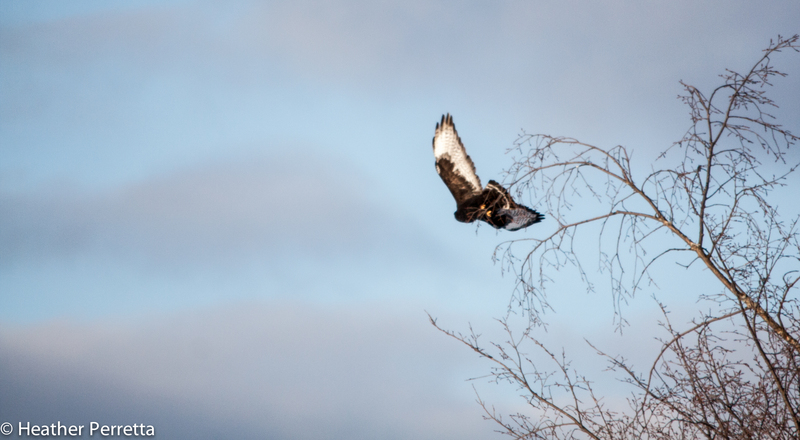 I watched it as it circled looking for prey then, with no warning, it turned and speedily flew toward the perched owl. As it completed its fly-by the perched owl jumped off the branch. With talons blazing it defended its post. A short chase ensued and then they went their separate ways. I tracked the owl with the lost feathers and noticed that I was not alone. A rough-legged hawk was also on its trail. They are determined to steal any meal they can. Finally, after traveling a couple of miles the owls, hawks, and I settled into our favorite field. I parked, the hawk perched high in a treetop, and the owls, who were back together, continued to hunt. I watched them making circles, working over the field for quite some time and forgot that the hawk’s watchful eye was still upon us. The owl that had trouble earlier caught a vole and was flying off to eat when the hawk came back into view. Coming fast I could see the impact before it happened. As the birds collided the owl was forced to drop the vole. The hawk fell on the spot where the vole landed and devoured it. The owl had no choice but to take to the sky and try again. It needs to eat to survive. 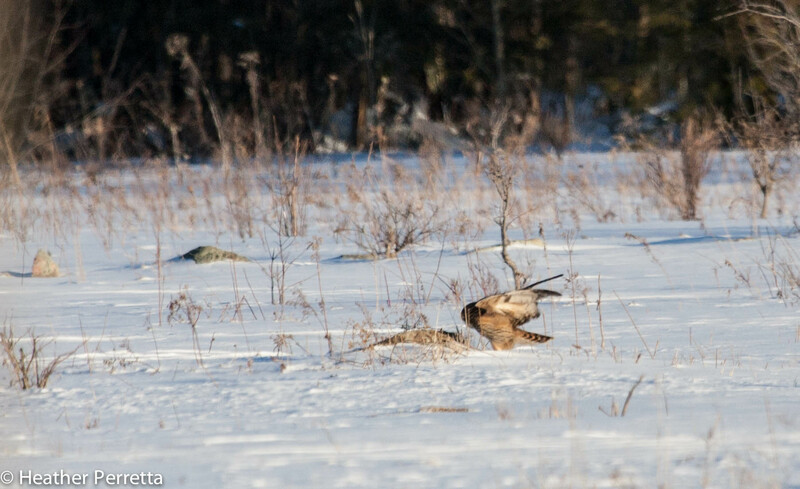 This evening a similar scenario was unfolding as a rough-legged hawk swooped in and stole the owls meal. 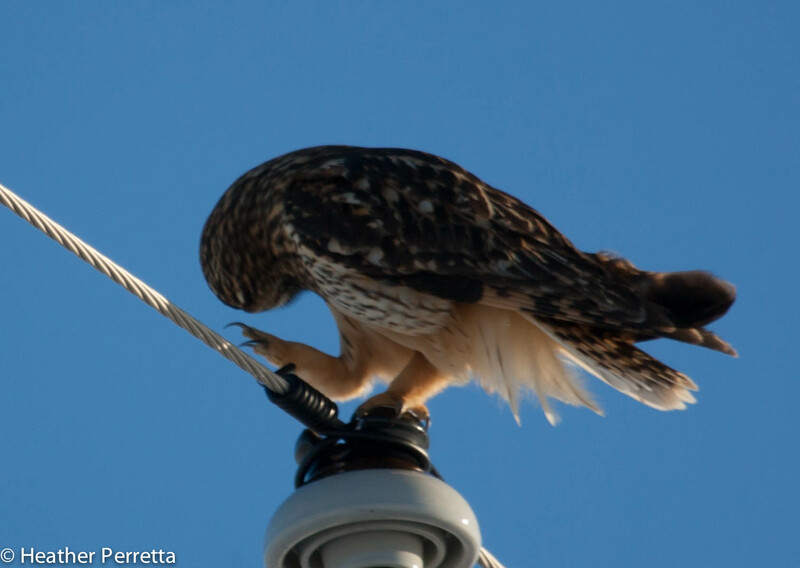 This time the owl flew with intent at the grounded hawk in an attempt to reclaim its prize. 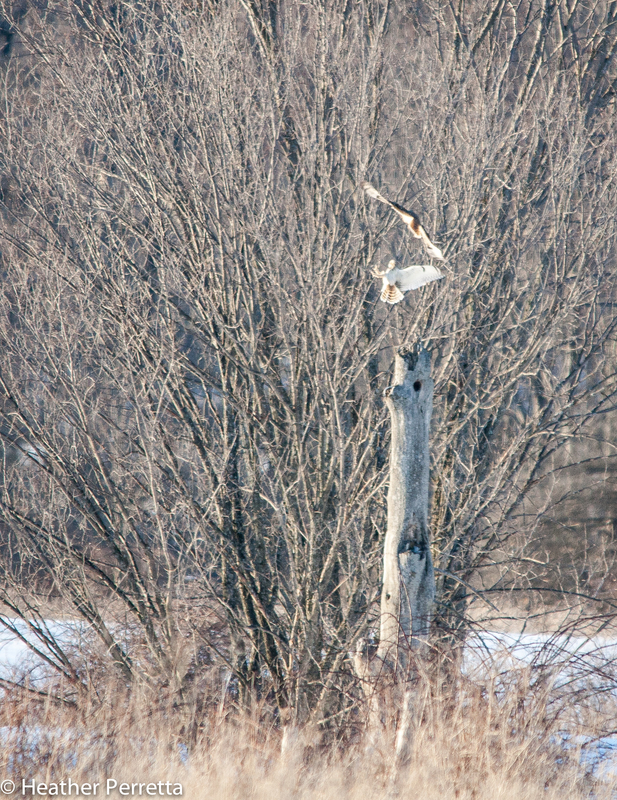 In the end the owl flew off to continue hunting and the hawk went back to its perch after a nice meal. 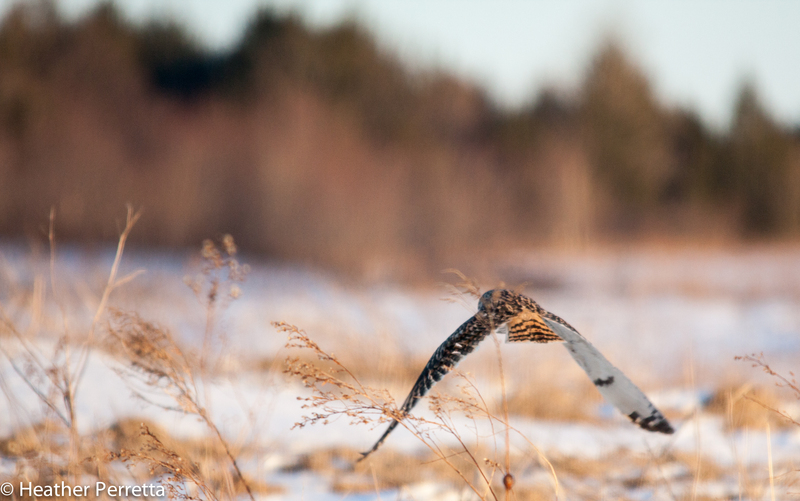 Despite the competition for food between the short-eared owls and the rough-legged hawks and the competition among the owls for each individual continues to do what it takes to survive. They are not deterred when the meal is literally knocked out of their grasp. They simply take flight and try again. The edge of the forest, the edge of the day, and the edge of the season are all places of transition and they are where magic happens. Taking advantage of edges puts us in the middle of the action allowing us to connect with nature in ways we cannot imagine. Spring is the time when we stand with one foot firmly grounded in winter and the other reaching toward the warm sunny splendor of summer. Temperatures and weather conditions can vary from either extreme at any time. As the winter passes I reflect on the beauty that has been and the beauty that is to come. This morning as I walked a brilliant sunrise broke through an otherwise gray sky. The birds were just waking up. I looked about me scanning for tiny flashes, flutters, or shifts out of the normal pattern of the gray branches. There was not much movement and the only bird I saw was a crow plucking morsels of food from exposed grass on the roadside. Just as the beautiful sunrise broke through the gray sky the sweet song of the black-capped chickadee broke through the motionless morning. I breathed deeply capturing the serenity of the moment in my inhalation. Then another familiar sound, the clear whistle of the northern cardinal. It reminded me that we are moving from a visual season into an auditory one. I will miss the x-ray vision that winter offers. Tracking prints in the snow gives us glimpse of what passed through during our absence. We can easily pick out birds and last year’s nest in the bare branches of the trees and gaze at tree skeletons that will soon be covered with leaves. Once summer comes birds are well hidden and I will shift from watching to listening in order to gain insight into the secret lives of birds. 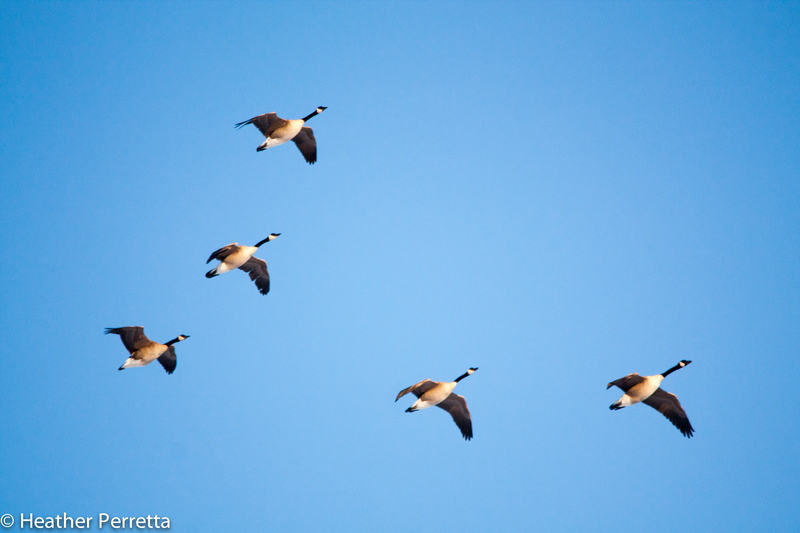 This winter has open my eyes to the wonders of migration. Migration brought arctic visitors to us and soon it will return them to the north just as our summer birds return from their winter habitats. Last night I was caught in the mix of two worlds. On my usual evening drive I stopped to create a video of two red-winged blackbirds back from the south to stake out their nesting sites. A little farther down the road I stopped to see a snowy owl that I have been observing for almost three months. Spring is the time when winter and summer mix. When snowy owls and red-winged blackbirds are neighbors in Central New York. I continued on my route to find a flock of snow buntings foraging in the corn field while short-eared owls and rough-legged hawks, both arctic breeders, hunted for voles nearby. I stopped to take it all in and a flock of Canada geese flew overhead on their spring migration. The experiences left me speechless. The magic of spring is upon us! I am drawn to the edges. I search for the small wonders, the interactions that make this place, this day, this season alive and miraculous. I had been sitting for about 15 minutes after I caught a wing flash just above the ground and pulled over to take a closer look. I watched the short-eared owl as it landed on a fence post and moments later prepared for flight again. Back in the sky it circled while paying close attention to every movement, every sound on the ground. Hunting for voles requires precise use of keen senses. I try to mimic the owl’s observation skills and take it all in. Suddenly I hear a sound, a chortle that I couldn’t quite place. 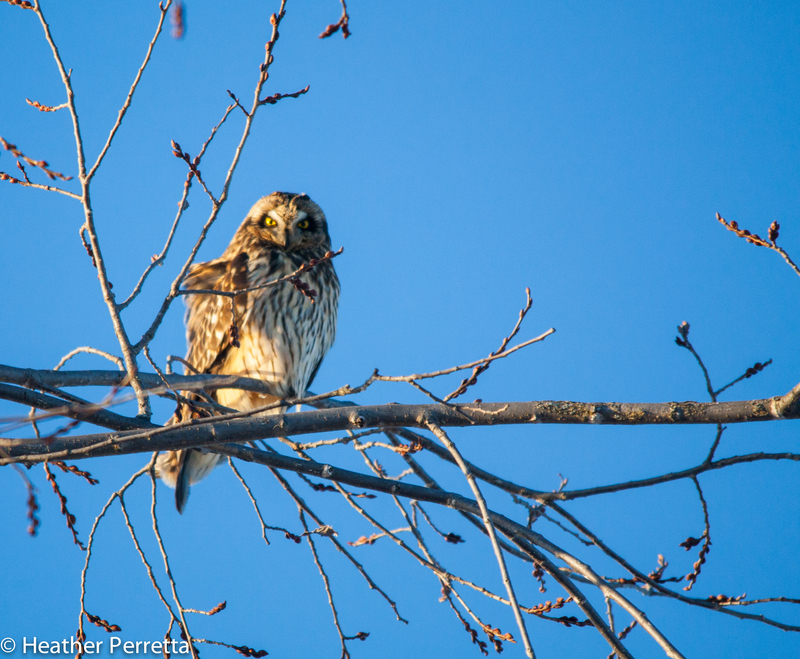 I looked up and, to my amazement, I saw a second short-eared owl. The pair flew in overlapping circles chortling and weaving their paths into one beautiful design. Sometimes they were quite close to each other and sometimes farther away. At one point they both perched briefly and then flew off in separate directions. I was stunned to witness this interaction. Little did I know that was not the end of my amazement. For quite a while the owls took turns coming into and going out of my view. Then I heard some chortling again and one perched on a fence post right beside my car window. My heart leaped! I calmed myself enough to take a few pictures before he landed on the ground nearby. 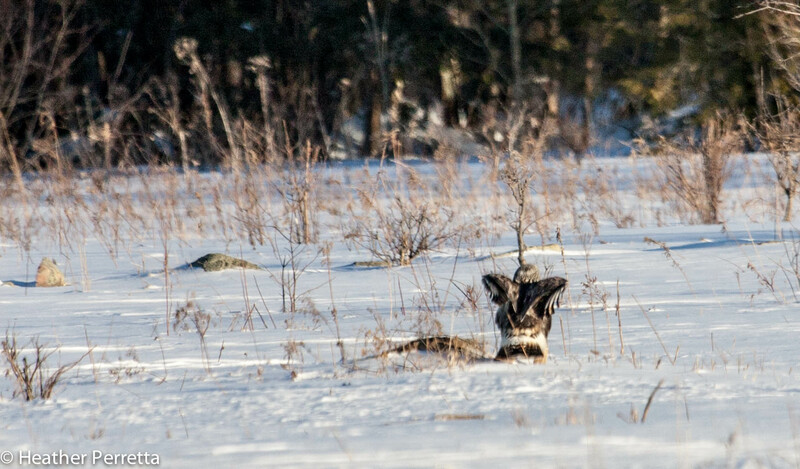 I watched as he tugged at something in the grass, much like what I witnessed before when a short-eared owl was being stalked by a rough-legged hawk. I wasn’t sure if he actually caught something until I looked at the pictures and saw a dark brown form in the owls mouth. After gobbling his meal he took to the sky again. Suddenly there was another noise I hadn’t heard before. This was not a sweet chortle. It was a rather raspy scream. I fallowed the sound and looked up. My mouth fell open, my heart beat faster, and my photography skills went out the window as I realized what I was observing. 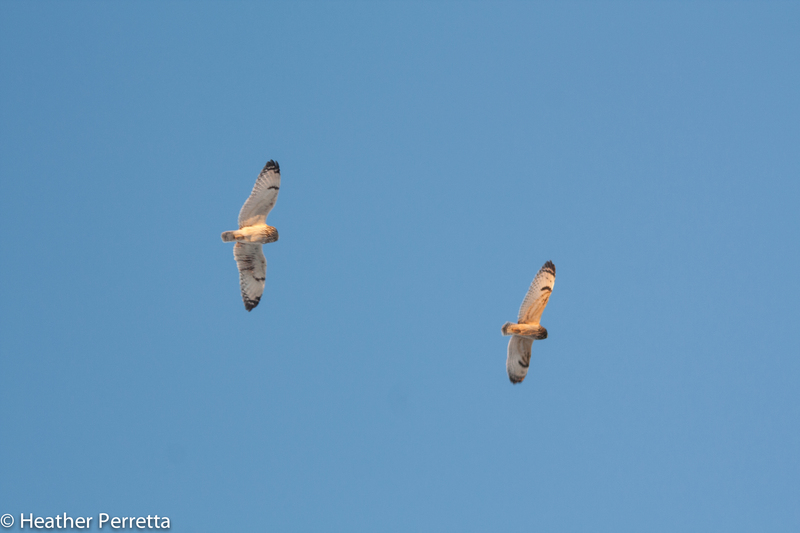 Three short-eared owls circled above my car. I tracked each individual and noticed that one had a vole in its talons. I heard more calls as they talked to each other and I got the impression that something wasn’t right. Just then a forth form appeared. It was light and with dark markings. It took a few seconds for me to understand what I was looking at. Was it a forth owl? No, it was a rough-legged hawk after a free meal. Short-eared owls live up to the saying “wise old owl.” They have skills born out of necessity that allow them to survive even when there is fierce competition. As I watched it became clear that two of the owls had come to the aid of the third, the one with the vole. I didn’t see it but my guess is that the hawk had been tracking the owl. It watched the catch and then followed in an attempt to nab what the owl caught. In response the owl called in reinforcements and they began to create diversion after diversion to confuse the hawk. It was like watching an owl shell game. They circled and switched positions while literally calling attention to themselves vocally when the hawk would get close to the owl with the prey. 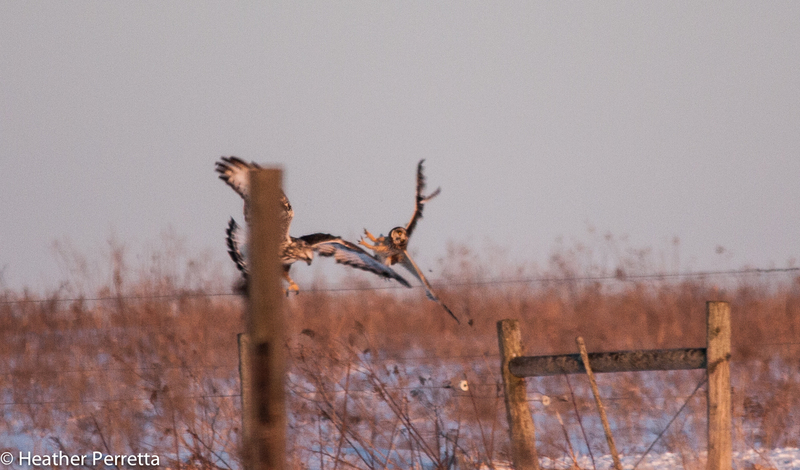 The three short-eared owls continued this complex strategy until the rough-legged hawk gave up and flew off. Once the threat was gone the owl with the prize retreated to the trees to eat. 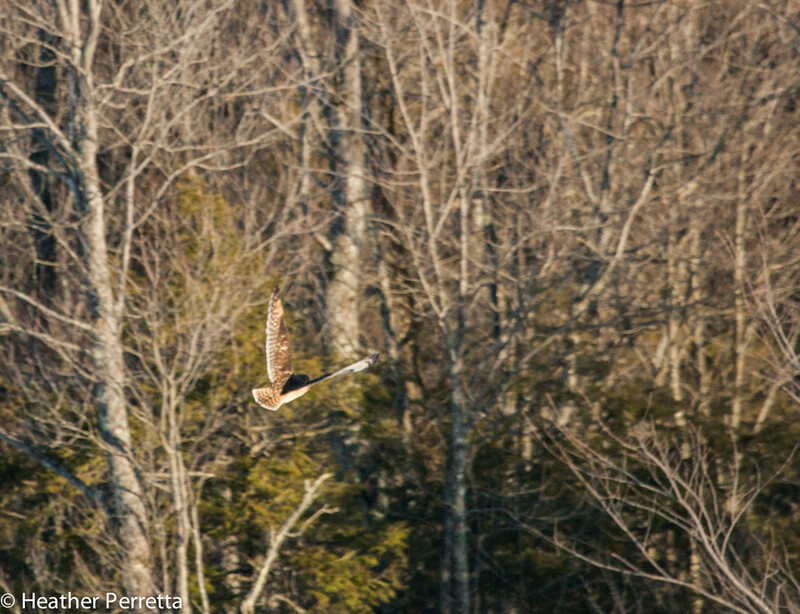 The other two owls continued to hunt in the field flying farther and farther from where I sat. As it grew dark I could still occasionally catch a flash of light from the underside of their wings when they turned and caught a last ray of sun. Note: This was one of the most incredible experiences of my life. As I type this I still feel as if I am up there with them circling around, a untied front securing the continuation of the species. I did my best to get some pictures of this experience but I will admit, as my Amish friend pointed out, I had “buck fever!” Here a couple more pictures so you can see what they look like from the back. 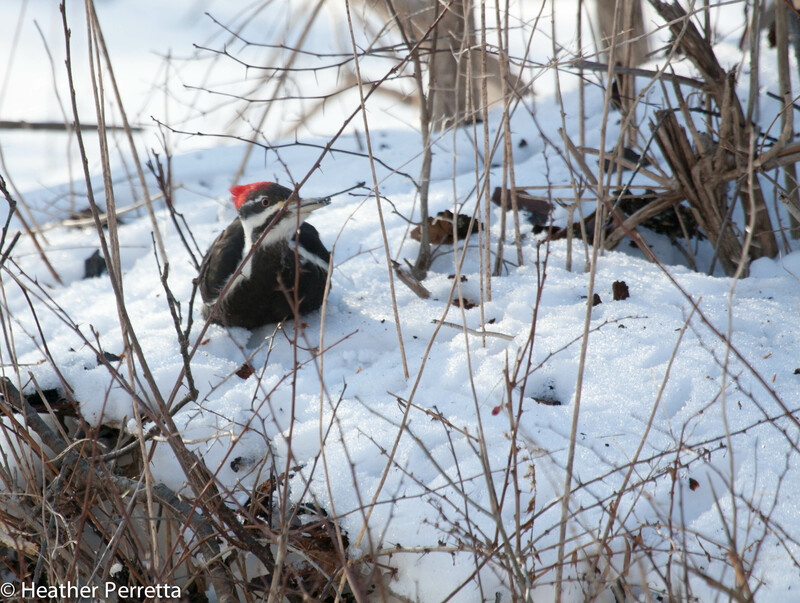 Birds rarely appear as picture perfect when we catch a glimpse or see a flash of color so it is important to share many angles to help with identification. Driving down the road I saw a shape in a tree ahead. Assuming it was a rough-legged hawk I slowed down and kept my distance. The rough-legged hawks I see are usually very flighty and I didn’t want to flush it from its perch in the sun. As I looked through the binoculars something told me that my assumption was wrong. I pulled a little closer. The bird didn’t move. I looked again. I could see a speckled dark brown back with a lighter belly. Where was the tail? The tail would give me a clue. I crept closer. The bird didn’t move. That in itself was an indicator that I wasn’t looking at a hawk. Now I was close enough to see that the tail was hidden by the wings. 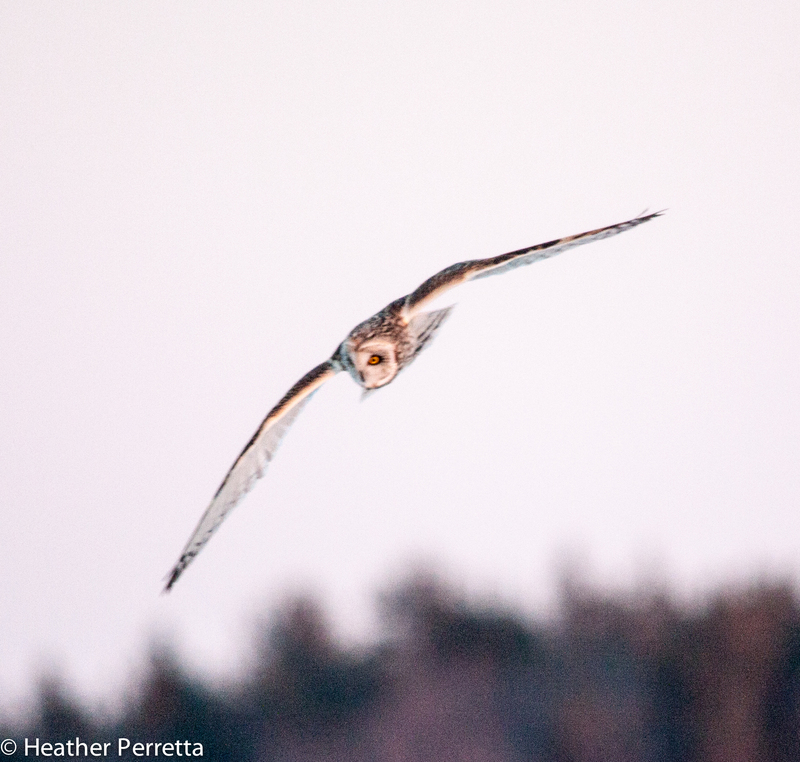 My heart beat harder as I came to realize that I was looking at a short-eared owl. I was convinced they had all moved on, that my encounters with them were chance and brief because I haven’t seen them in more than a week. It seems that the area suits them, for now. I watched as the owl sunned itself, keenly observing its surroundings. They often spend time in the late afternoon perched surveying the area and then when the time is right they take to the sky looking for food. 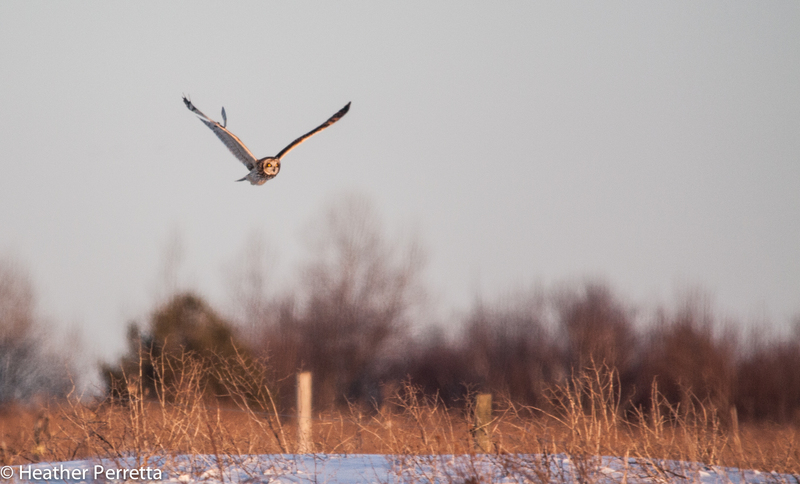 Flight seems effortless to short-eared owls. The song from the musical Oklahoma played in my head as I watched it “making lazy circles in the sky.” Once in flight the owl flew from the safety of the trees into the open air over the fallow field. I saw another figure approaching. As it came into my field of view it took me a minute to realize that I was seeing a rough-legged hawk approaching pretty rapidly. Again my heart was racing but this time it wasn’t with excitement over seeing an owl. I was worried. A rough-legged hawk is a pretty powerful bird and is definitely higher in the bird hierarchy. 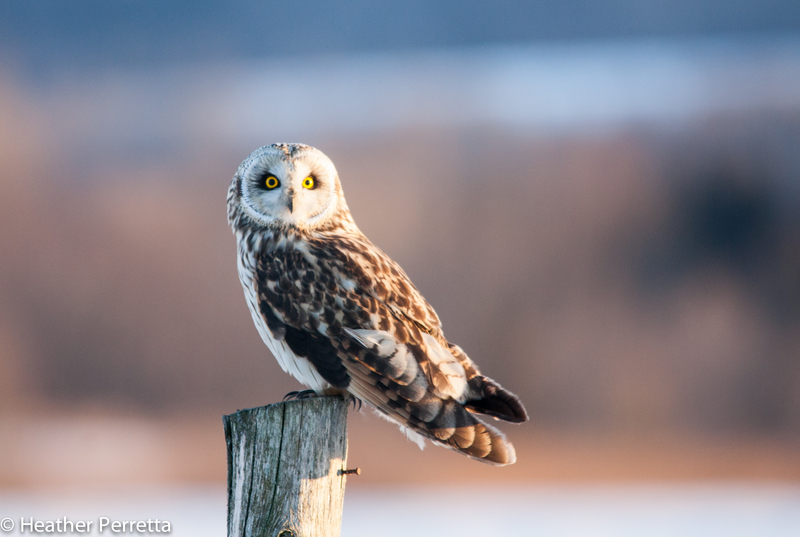 It could easily drive the short-eared owl out of the area or even attack it. Most of the time I am pretty objective about how things play out in nature. This time I was definitely biased on the side of the owl. Since I had no business being involved all I could do was watch and wait to see what would occur. 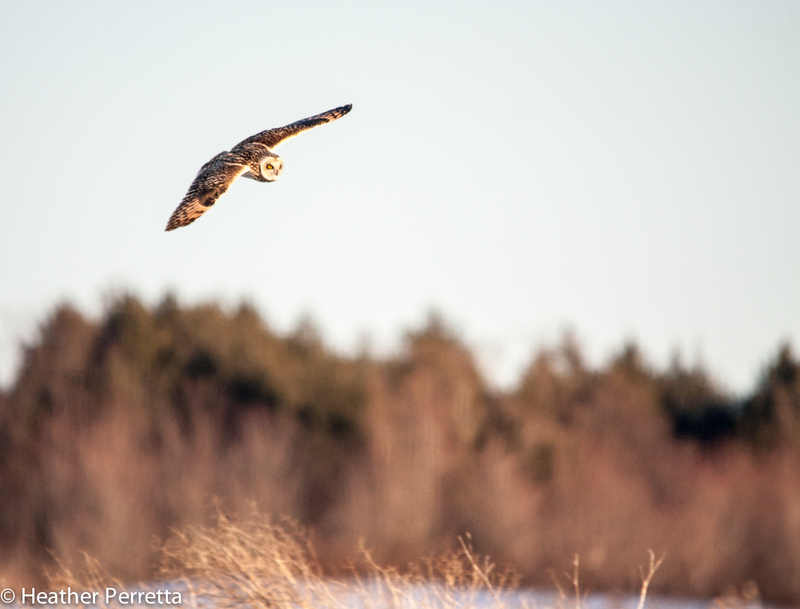 Thankfully short-eared owls are adept flyers and it easily maneuvered out of the hawks path. The hawk seemed to be making its presence know and positioning itself to capitalize on a free meal if the opportunity arose. At this point the owl put a good distance between itself and the hawk and I lost sight of the owl for a time. The next thing I saw was a dark figure flying fast toward the area where I the short-eared owl had been. 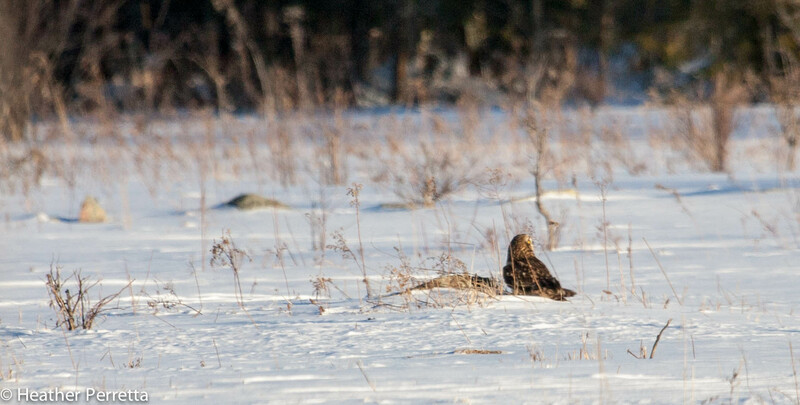 On closer inspection I discovered that it was another rough-legged hawk, I often see a pair together in this area. Once again I was nervous, where was the owl? 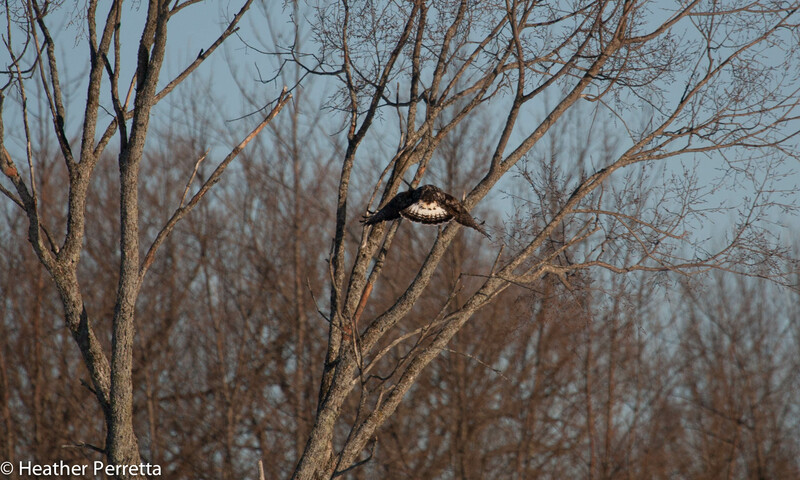 Then I saw it, far ahead of the hawk and retreating quickly to the safety of the trees. At the same time the first hawk that was perched in a tree also took to the sky and the two attempted to converge on the smaller owl. The owl had the advantage this time and reached safety before the hawks to could catch up. Both hawks stopped short and perched at the edge of the field. The owl was tucked away in the trees far enough away that the hawks could not see it. 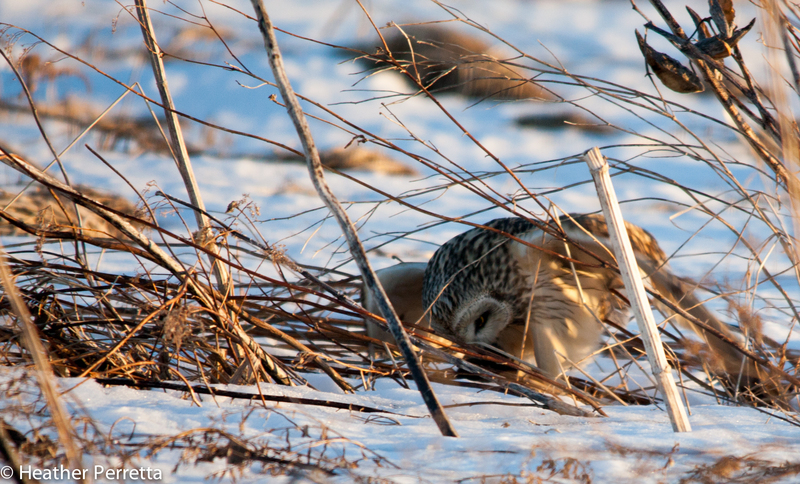 As I approached the owl I could see it was jumpy because of its close encounter with the rough-legged hawks. It warily looked over its shoulders. I can only imagine the adrenaline rush that comes with out flying your adversaries. I kept my distance so I didn’t add to its anxiety and it wasn’t until it turned around that I discovered why it was so wary. Dinner was in its talons. A plump vole would have made and excellent meal for a rough-legged hawk. This time they will have to hunt for their own dinner. 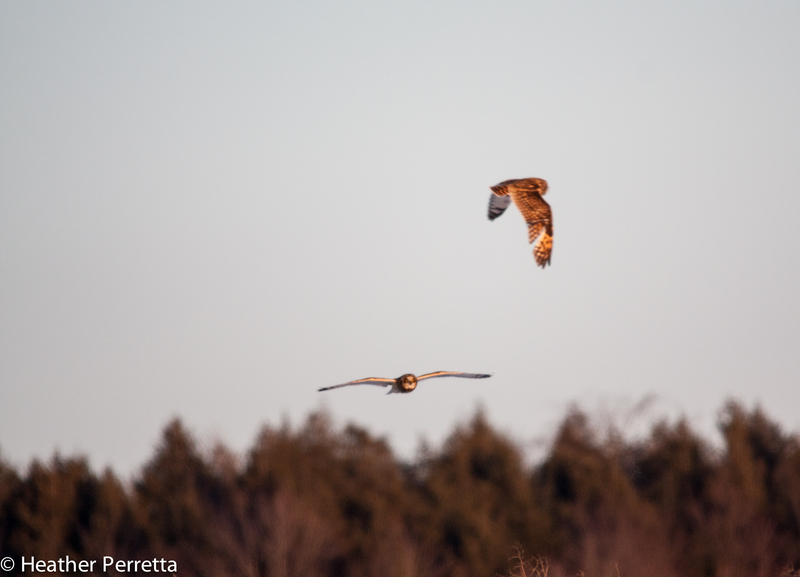 The short-eared owl slipped into hawk territory to hunt and slipped back out with the prize. When stories like this unfold before my eyes I am filled with gratitude. I am grateful for this amazing planet that we are part of and grateful that I have the opportunity to witness the everyday miracles in nature. Although it is cold and snowy, spring is on the way. Birds are beginning to migrate and find a mate if they do not already have one. I look for ducks on the West Canada Creek several times a week to see which species are around. Throughout the last several months have seen common mergansers. red-breasted mergansers, hooded mergansers, common goldeneye, and buffleheads. Lately I have been on the lookout for courting behavior and yesterday I saw a little spark. Yesterday I saw this mixed group made up of a female red-breasted merganser, a male hooded merganser, and three common goldeneye (one male and two females.) 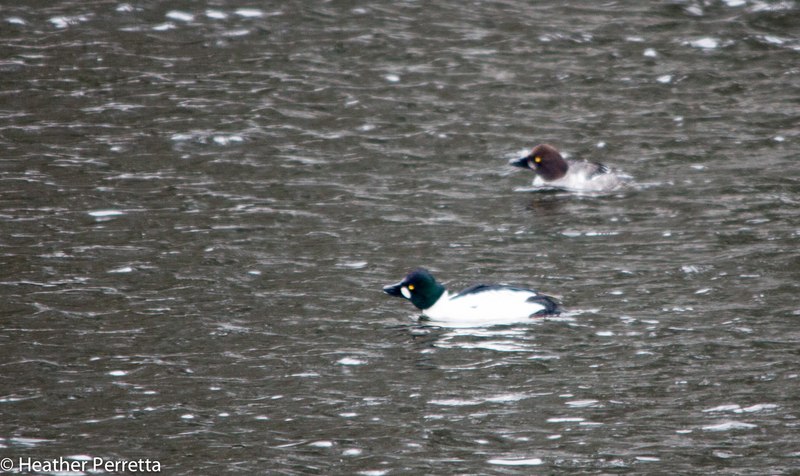 As I watched them The male goldeneye began to sit up a little higher in the water and then he flung his head over his back while calling loudly and kicking water up behind him. It happened in a instant and I was not the only one impressed by this display. One of the females stayed pretty close to his side after that as the whole group began preening. I missed the opportunity to photograph the actual display. Here is a picture of what he looked like when he was getting ready to make his statement and the two of them after. Be on the lookout for all kinds of mating displays, spring is in the air! The golden tree trunk caught my eye and my brain ran through the many possibilities for this anomaly. It was a sunny afternoon but this was not the result of brilliant light hitting the bark of a cherry tree. As I slowed the car to take a closer look I saw a flash of red and then another. 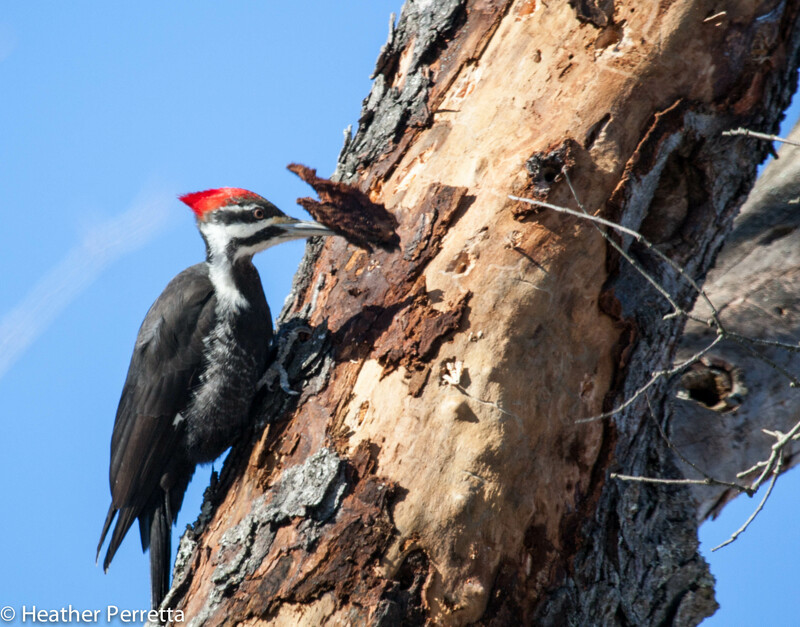 Immediately I recognized the large birds as pileated woodpeckers. I sat and watched the woodpeckers. They worked diligently to strip away the outer covering of the tree to expose insect larvae, tasty morsels that make up the diet of a woodpecker. Under the tree the snow was littered with bark and wood chips that were chiseled off of the trunk. Suddenly the woodpeckers head snapped around to watch as something fell the ground. It took flight chasing after what I could only imagine was a bit of food that was mistakenly dropped. Once on the ground and looking around the woodpecker called several times announcing that something was wrong, its food was lost. As is sorted through the litter to find the missing morsel it called a few more times. Then, at last, success! It gobbled up the larvae, hopped on the tree trunk, and climbed back up to the job site. Getting back to the important work of survival. 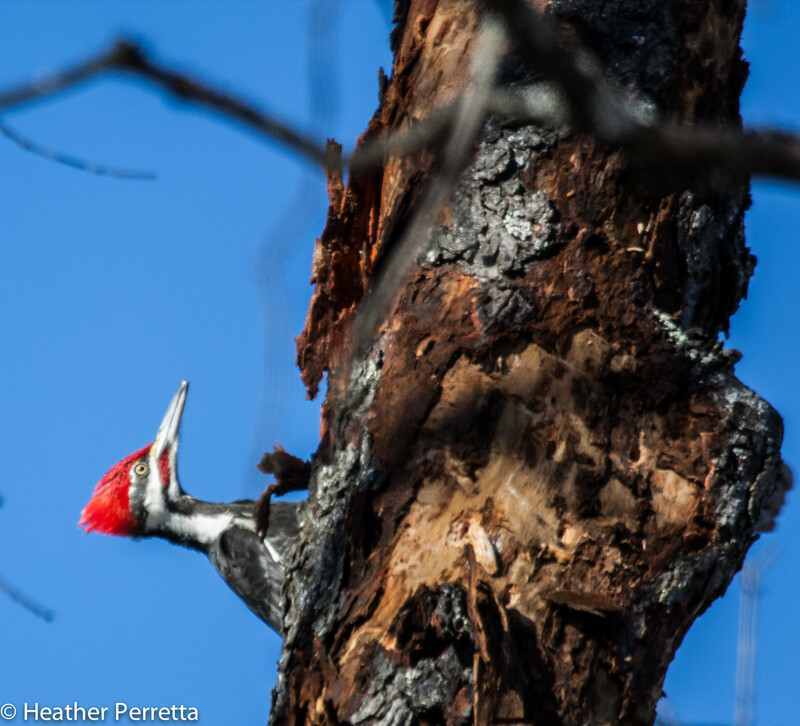 Note: Woodpeckers are well adapted to climbing trees and hanging onto the bark while foraging. In the above photograph you will notice that they have long toes with sharp, strong nails that hold the tree tightly. In order to balance while using their beaks to chisel and pry off back their tail feathers are quite stiff and come to a point. This allows them to apply pressure to their work without tipping over or losing their grip. 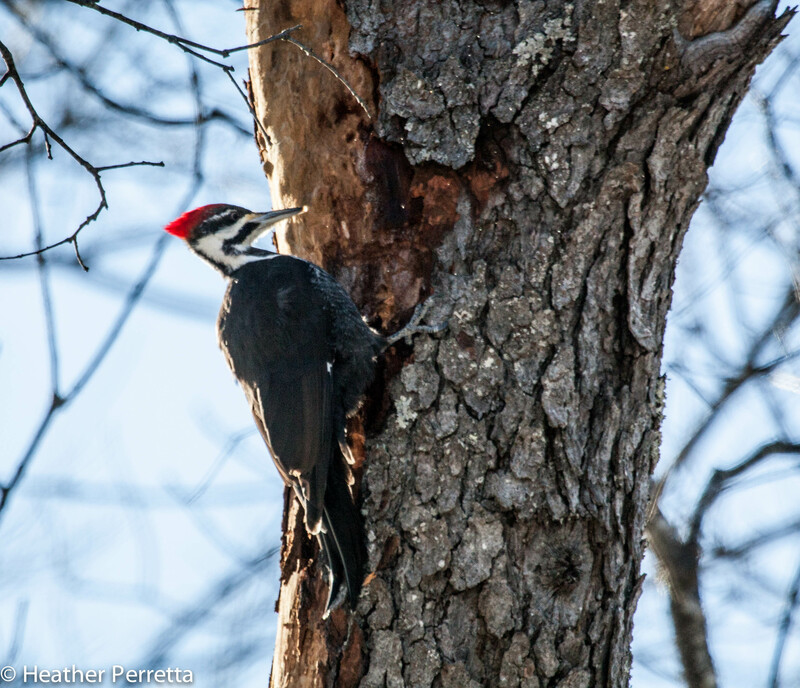 When you are out driving or walking if you see a tree that looks unusually bright and sunny it is most likely missing some bark due to the activity of pileated woodpeckers. 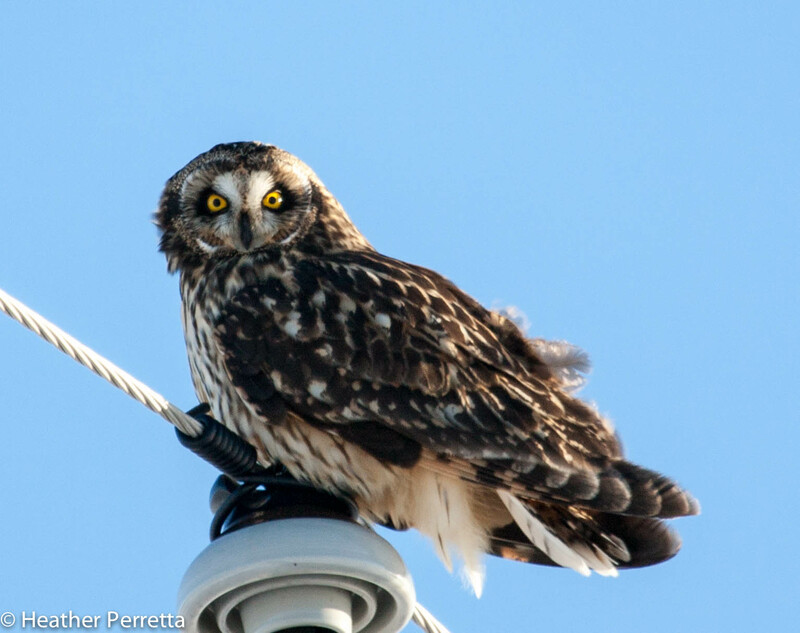 Around dusk today I got lucky and happened upon a short-eared owl perched on a utility pole. Such a gorgeous owl! From what I have observed when they are getting ready to fly they often preen or at least shake their feathers out, excrete, and then take off. Here are a couple pictures of that process. Look at the length and sharpness of those talons! This owl took off, swooped over the ground in several arcs and landed on a fence post. The post offered a different vantage point and a few minutes later the owl repeated the process and took off again. This time making increasingly smaller arcs until it dropped to the ground. It put its head down into the grass and did a tugging motion like it was pulling something out of the tangle of dried plants. I expected that it would soon take off with its dinner. Instead it stood on the ground looking over one shoulder. What was it looking at? When the owl took off and I got a clear picture of what was taking place. 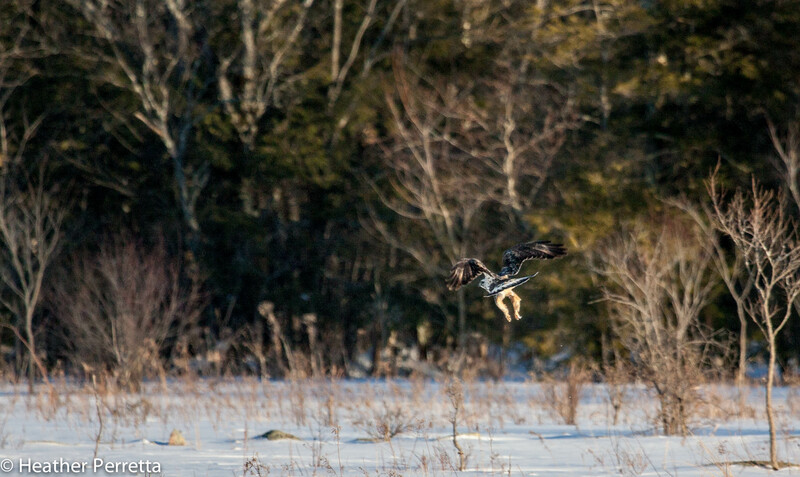 In came a rough-legged hawk, landing on the exact spot where the short-eared stood moments before. It too stuck its head into the grass. It came up with nothing, presumably because the owl quickly ate what it caught. 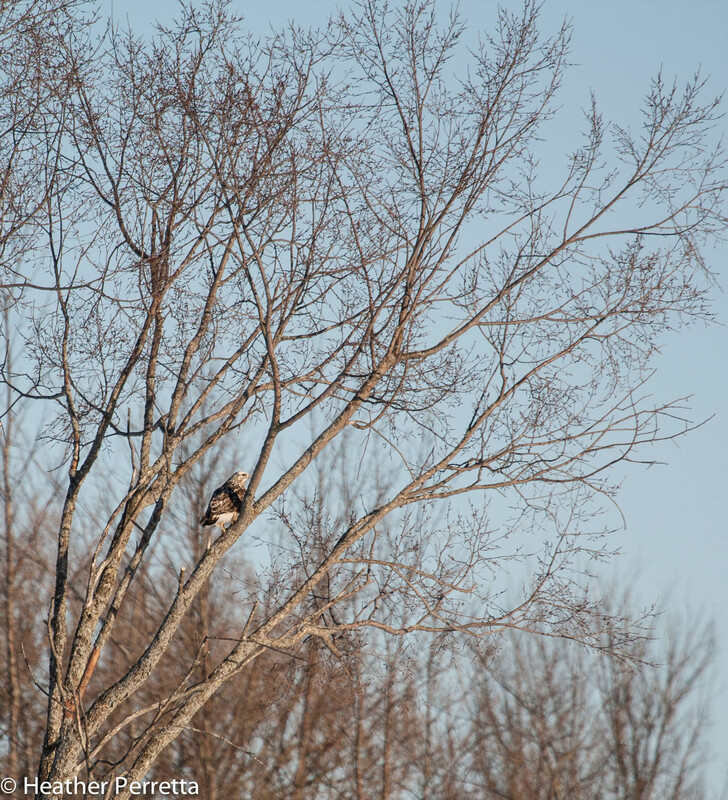 The hawk flew up to a tree to keep an eye on the owl that had retreated across the road. Because they must work for every meal often it is easier to let someone smaller do the work and then steal its food. I’m pretty sure that is what the snowy owl was doing to the rough-legged hawk the other day and now the hawk returns the favor to the short-eared owl. There is a hierarchy and the lesser bird has no option other than to eat as fast as they can or leave the meal behind.